Washington, D.C., is ruining baseball. At least, it’s ruining the experience of going to and enjoying a baseball game. That’s my conclusion after going to a game today during which I was barred from going to my seat and prevented from having a normal conversation with a friend. After arriving late to the game, I headed to my right field seat only to find an usher blocking my way. “You can’t go to your seat right now,” he told me. Why not? “Because the game is in action.” The seat was three rows from the back of the section and one section from the foul pole. “Are you serious?” I asked him. He said he was. I was flabbergasted. It made no sense. Am I distracting the fielder? The pitcher 200 feet away? The hitter 250 feet away? Other fans? After 100 years of baseball, we’ve now decided that we have to be like golf or going to the theater? After the third out, the usher let us go to our seats. As I sat down, I wondered if I was allowed to stand up during the game. Could I stretch? Go to the bathroom? Yes. I could get up and leave, but I couldn’t return until a stop in the action. Utterly insane. Then, while sitting in my seat I tried to have a conversation with a friend. It proved impossible and not just because I’m nearly incapable of having intelligent conversations. No, the problem was the incessant, loud and unceasing music being blared through the speakers hanging above us. Every half inning was filled with music and inanity on the Jumbotron. During play, snippets of music would inject themselves into any pause in the action. It was awful and it didn’t used to be this way. When I was a kid, I was mad about baseball. I listened to every Indians game on the radio and went to any game I could. I’d plan days around games to make sure I’d be able to listen to all 9 innings. And going to a game was a magical experience. I’d trek to the old Cleveland Municipal stadium — a massive 1930s-era brick and steel structure on the shore of Lake Erie — and enter the dark, dank concourse. While the smell of stadium mustard and urine wafted in the air, we’d make our way to the dark tunnel leading to our seats. Then we’d reach the end of the tunnel and laid out before us was a Major League ball field. Walking through the tunnel was like traveling through a wormhole, leaving behind traffic and bullies and chores and entering a world of emerald green grass cut into amazing patterns, bright white bases poking out from the perfectly manicured infield, and ball players effortlessly throwing line-drive ropes to each other. My friends and I would take our seats, share a bag of peanuts, and chat while enjoying the game. We’d hope for foul balls, sing along with organ music and turn our caps inside out in vain to summon a late-game rally by when we’d have made our way down from our lousy upper deck seats to a lower box seat along the baseline. In the distance we’d hear John Adams banging his drum. 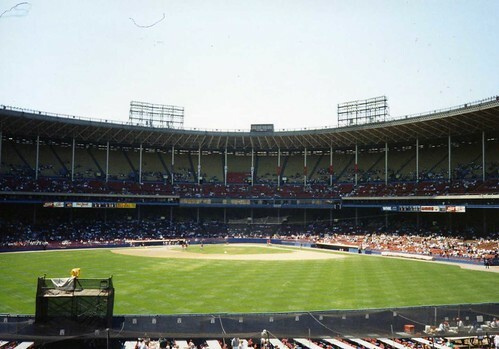 Of course, Municipal Stadium was a dump (there’s a reason it smelled of urine, of course), and the Indians sucked my entire childhood, but it was still fun. We *enjoyed* it. That’s something I can’t say about going to a Nationals game. There’s no magical moment when the field is revealed to you. Instead, it’s just… there. There’s no opportunity to talk to friends or simply relax and enjoy the game. Instead, you have to be stimulated and “entertained” at every moment. Maybe I’m just getting old — and I’ve always been cranky — but I think this is one of the reasons baseball is losing its appeal. At least, that’s the case for me.